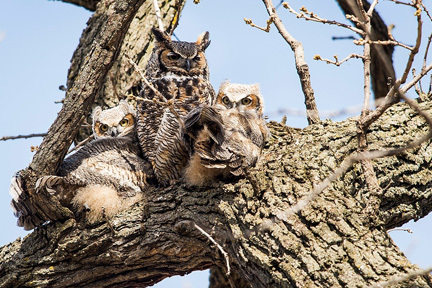 Great horned owls by Jeff Miller/UW-Madison. 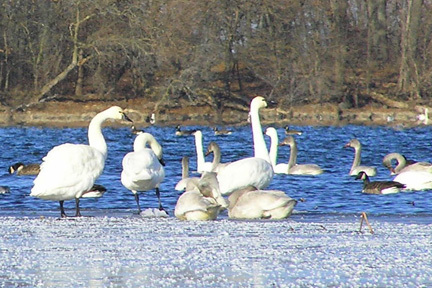 The University of Wisconsin-Madison Lakeshore Nature Preserve provides opportunities for students and the public to view a wide variety of birds in a relatively small area. The Preserve has multiple habitats, allowing it to support diverse populations of birds. The Preserve has woodlands (Picnic Point, Frautschi Point, Eagle Heights Woods), marshes (Class of 1918 Marsh, University Bay Marsh), open water (Lake Mendota, University Bay), and prairie and open lands. Over 255 bird species have been seen in the Preserve. Most birds that regularly occur in south central Wisconsin have been found in the Preserve. Birding in the Preserve is best during migration. Migrants can be found anywhere in the area. The Preserve supports a diverse breeding bird population as well. During the 2000 to 2002 Breeding Bird Study, 81 bird species were confirmed or probable nesting birds. During the 2013-2015 Breeding Bird Study, 77 bird species were confirmed or probable nesting birds with another 13 species as possible nesters. The Lakeshore Nature Preserve is perhaps best known for its warbler migration. Between April 25 (some years a little earlier) and May 22 (some years later) 30 or more species of warblers are usually observed in the area, though not usually all at once. Rarer warblers such as Hooded, Cerulean, Yellow-throated, Black-throated Blue, Prothonotary, Mourning, and Connecticut are reported at least once most years. Picnic Point can have spectacular passerine migrant “fall out” in the spring. These unusual weather related events can isolate hundreds or thousands of migrating birds on the Point for several days, often allowing visitors to see 20 or more warbler species (and multiple individuals of many species) in a couple of hours in May. In the fall (August 20-Oct 5), Frautschi Point usually has more song bird migrants, but Picnic Point, especially the Picnic Point Marsh, also hosts migrants. When the winds are from the north, woodland migrating birds prefer Eagle Heights Woods. When the winds are from the south, these migrants can be found at the lake edge in Tent Colony Woods. In the fall the field edge can be productive for woodland migrants. The prairie, garden, and old fields support a diverse set of sparrows, especially from mid-September thru October. Tundra swans by Bryn Scriver. Most waterfowl visit annually. The diving duck numbers and diversity are best late in the fall (mid-November until freeze up) and in spring immediately after the ice breaks up, when there are fewer boaters. Although University Bay is usually the best area for divers, Second Point Bay (between Picnic Point and Frautschi Point) should also be checked. The Class of 1918 Marsh supports a diverse population of dabbling ducks throughout the fall. Loons, grebes, gulls, swans, and coots can also be observed along the lake shore. Shorebirds, terns, and wading birds can periodically be found at the Class of 1918 Marsh and University Bay near Willow Creek. Hawks regularly migrate through and can be best seen from the open areas and the Class of 1918 Marsh. Crane and chick by John Magnuson. The Preserve is a migratory stopover site for many passerine migrants. Most years more than 30 species of warblers, 5 species of vireos, 8 species of flycatchers, 13 species of sparrows, 5 species of thrushes, and many other species visit the Preserve in the spring and/or fall. Usually the number and species diversity of migrants is greatest at Picnic Point in the spring and at Frautschi Point in the fall. The Preserve has many colorful birds, including resident Cardinals, Blue Jays, and American Goldfinches, breeding Baltimore Orioles, Eastern Bluebirds, and Indigo Buntings, and migrating Rose-breasted Grosbeaks and Scarlet Tanagers. 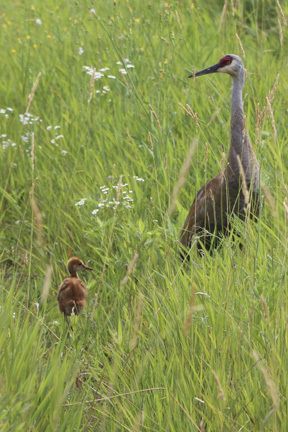 The Preserve has a nesting Sandhill Crane pair. They can often be observed dancing in the marshes in the early spring and feeding in the open areas with their chick. Bald Eagles can be seen in the Preserve in any month, although they are more common in the early spring and late fall when Lake Mendota is not completely frozen over. Ospreys visit regularly in spring and fall and occasionally in the summer. Both are more frequently seen from Biocore Prairie or Frautschi Point than from University Bay. Two night hunters, Great Horned and Screech Owls, and two day hunters, Red-tailed and Cooper’s Hawk, nest in the Preserve and can be found most of the year. Great Blue Herons and Green Herons are usually present daily in the Preserve from May though September and Great Egrets and Black-crowned Night-herons visit annually. They can sometimes be seen at the mouth of Willow Creek or in the 1918 Marsh. Sora and Virginia Rails, Marsh Wrens, and Swamp Sparrows regularly nest in the restored Class of 1918 Marsh. University Bay and the Class of 1918 Marsh support a diverse set of waterfowl. These waterfowl visit both spring and fall, but stay longer in the fall. In the fall the dabbling ducks feed in the restored Class of 1918 Marsh unless low water forces them to feed in University Bay . The diving ducks and Tundra Swans arrive later in the fall and feed in University and Second Point Bay, reaching their peak numbers in late November and December after other shallow ponds begin to freeze. Common Loons can usually be seen and heard on Lake Mendota whenever it is not frozen, but are most common in spring and fall. The Biocore Prairie Bird Banding Station has banded more than 70 species of birds at the Preserve. Download the Bird Checklist by month (130Kb pdf file)The Preserve bird checklist shows the seasonal abundance of 246 bird species and lists 12 accidental species. Fifty-five bird species nest regularly and 23 bird species nest in some years, based on the 2000-2002 Breeding Bird Study, which confirmed the breeding of 69 bird species and identified 12 as probably breeding in the Preserve (two of these species were subsequently confirmed). This checklist is based on volunteer observations over the past 25 years. At least 220 (87%) of these bird species were been observed between August 1999 and August 2001, when the primary data for the checklist were collected. Please send reports of rare (indicated by a * on the checklist), accidental, and out of season birds to Preserve staff.